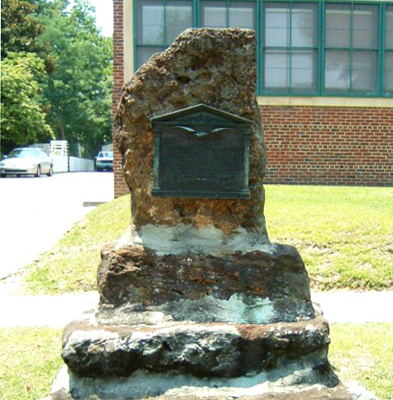 A bronze tablet is attached to a rough stone pyramid made of stones taken from the foundation of the destroyed arsenal’s ordinance building. The tablet was cast as the front elevation of a Greek revival architectural style building. In relief on the building’s pediment are several components from the Great Seal of the State of North Carolina, to include the state motto” Esse quam videri” meaning "To be, rather than to seem". Also prominent are the figures Liberty and Plenty facing towards each other. A bas-relief eagle in flight is directly below the pediment with the inscription appearing below the eagle’s spread wings. A bronze plaque dedicated to the FILI (Fayetteville Independent Light Infantry) Bicentennial celebration has been placed at base of the monument. The North Carolina Historical Commission and the United Daughters of the Confederacy, J.E.B. Stuart Chapter. Governor A.W. McLean was the featured orator. Speaking on the spirit of North Carolinians and the state of the economy in 1928 he said, “the same courage and valor with which they followed Lee and Jackson in time of war, they attacked the peace problems, chief of which was providing the necessities of life, and here they won a great victory.” Mrs. John Huske Anderson with the local Daughters of the Confederacy chapter served as chairperson of the ceremony. Captain Samuel J. Ashe, an officer who had served at the arsenal 69 years prior was in the audience. Also known as the Arsenal Marker. This monument commemorates the arsenal built at this location in 1838 and destroyed in 1865 during the Civil War. Confederate troops took control of the arsenal after it was vacated by Union forces in 1861. The Union later planned to regain control of the arsenal; Sherman took possession of it in 1865 and ordered it to be destroyed. This plaque design, approved by the state legislature was used over a period of years in memorials associated with the North Carolina Historical Commission. Other examples of the same plaque design are Daniel Boone and Nathanael Greene in Lexington, Bentonville Battlefield marker in Bentonville, and Richard Caswell Memorial in Kinston. The memorial seats on a grassy area by a side walk. The marker is located in the four acre Arsenal Park. It is next to the Museum of the Cape Fear. Though little remains of the Arsenal, one partial frame outbuilding still stands on the site. The park in which the memorial stands is used for educational events led by the Museum of the Cape Fear.